I know that saying this is going to solidify that I’m an absolute nerd..like those of you sitting on the fence thinking “she’s a bit weird but I don’t know maybe she’s still cool” will now have a clear answer. I’m basically the nerd emoji in human form. But…nothing makes me happier than a new month. Purely because of the little nerdy things I do like I get to set my new monthly intentions and goals, I start a new monthly budget spreadsheet, a new monthly horoscope is released... and is that the smell of a fresh start and opportunity in the air? Yep see. Weird. BUT let me tell you I’ve got a few hacks and routines for the start of each month that set you up with a clear direction for success, productivity and getting closer to kicking those goals you have. SO basic but an absolute MUST do first. The best part of a new month is scheduling in all the awesome and exciting things you’re going to be doing, working on, travelling to etc. First take a monthly view – start adding the following things into your digital calendar (because agendas are so not as efficient as we need them to be). (If you haven’t booked in these appointments yet and see gaps in your calendar – now is the time to book in and set a date/time otherwise it won’t happen). Look at the previous months calendar and see if there are any outstanding bills that need to be paid. Make sure you’re all done and dusted with the previous months finances so you can move onto the next month (also who wants an overdue bill – aint nobody got time fo dat). Now you can start your new budget for the month, referencing your calendar to see where you may need to allocate slightly more monies and seeing at the end how much you are aiming to save. It is so important to have a plan of how much you want to spend and an idea of how much you can save that way you are more likely to stick to it and are accountable for your spending. This will definitely get you to your saving goals quicker than not tracking your expenses Review Your Goals I spoke about this at the start of the year when I outlined how to set your new year resolutions but I recommend having yearly goals, 6 month goals and monthly goals. This allows you to set huge goals but then reverse engineer them into achievable little chunks with closer deadlines. Why is this so important? Because you can’t sit there in April and say “I’ve got until December” because you have mapped out exactly how to portion out all of the work. An example of this is if I want to read 30 books by December, I have to have read 15 by June so approximately 2-3 books a month. If I want to save $30, 000, I’ll need to save $15, 000 by June and approximately $2, 500 of my pay check each month. So each month take the time to look at the progress you have made on your goals and map out where you want to go in the next month. Are you at the stage where you thought you were? Can you get there any quicker if you change something, if so what is it? Tracking the timeline of your goals not only keeps you accountable but gives you a clear roadmap of where you are headed. What did I do this month that I’m proud of? How have I been approaching situations? Have I been acting out of love and not fear? What do I want to change this month? What good habit would I like to implement that will serve me? What’s going well and what isn’t? Why? Gain self-awareness and boost self-esteem by checking in and getting real with yourself. Be your own best friend, help guide yourself through breakthroughs or difficult situations you are facing. Being aware of the good and the bad allows you to pat yourself on the back or help yourself come up with a plan to improve something. Maybe set an intention or theme for the month like “health”, “personal growth” or “getting out of my comfort zone”. Something to focus on helps you to not feel overwhelmed. This self help stuff is hard work and you’ve got your whole life to make improvements so don’t bog yourself down with too many. A fun list is so awesome! It’s all the things that make you super happy and light you up inside that you want to do sometime throughout the month whenever you find the time. It could be any of the following; movies you want to watch, a beach trip, a solo adventure to park, a book you want to start or finish, a recipe you want to try or a restaurant you want to go to. This makes sure that when you have a few hours or a whole day spare, you have a handy dandy list to remind you of all the fun things you want to do. That way you’re not always sitting there thinking “I still haven’t seen that movie” or “I haven’t made it to the beach yet and it’s almost Winter”. 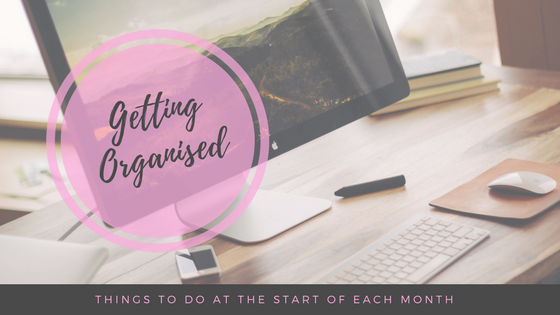 So those are my tips for setting you up for an organised month, do you have any I have missed? Leave them in a comment below!